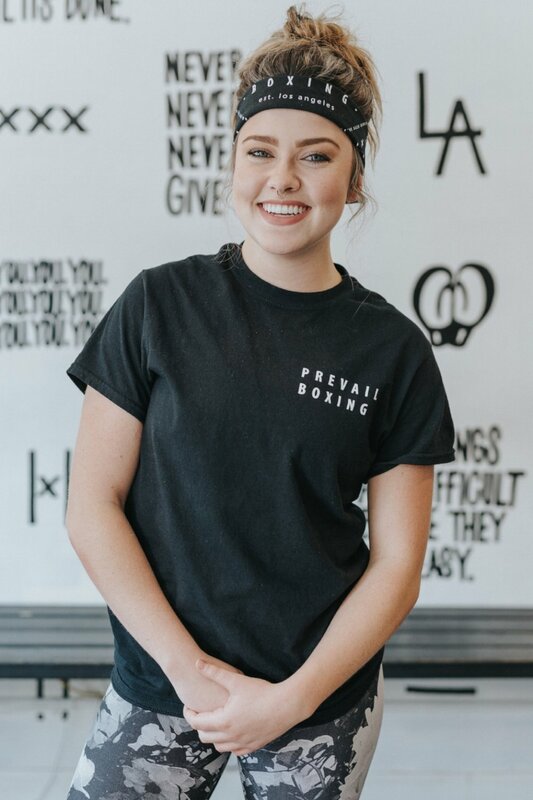 Prevail is LA’s premier fitness boxing studio, offering a clean and welcoming setting that focuses on getting fit through the art of boxing. At Prevail, we incorporate the mental, physical, and emotional challenges of boxing into a fitness regimen and lifestyle. By providing high-energy group classes that are designed to test your limits and help you exceed your own expectations, Prevail uncovers what it truly means to realize your potential. Our coaches are passionate about cultivating an environment where clients can improve endurance and strength, sculpt a lean and toned physique, and learn a complex skill set through the art of boxing. With every punch, we inspire and unleash the inner warrior that fights hard and dreams bigger. The SWEAT is what our community knows us best for – it’s the perfect blend of fundamental boxing technique & the latest in full body conditioning packed into a high-energy, music-fueled circuit workout aimed at helping you achieve a killer physique & a champion mindset. While you can always expect a carefully crafted balance of boxing & full-body burn, we have three variations on our signature SWEAT class to challenge your body, engage your mind, and give you just the right dose of aerobic, anaerobic, and strength training. All you have to do is show up. In SWEAT: leaner, we’ll work at a steady, non-stop pace from the first minute until the bell rings. By striving for sustained effort to maintain about 70-80% max heart rate, we’ll keep our bodies in the maximum fat-burning zone. Whether you’re training for a fight or fighting off those extra lbs you got as a souvenir on your last vacation, consider this class your scale’s biggest rival. All levels welcome. In SWEAT: stronger, we’ll build lean muscle by using added resistance such as weights, booty bands, medicine balls, TRX, rowing machines & more. In boxing, speed and agility are key, so every muscle needs to serve a purpose - we’ll focus on long, lean muscle and tone exactly what you need… and everyone needs a six-pack, right? All levels welcome. In SWEAT: faster, we’re blending boxing & HIIT for the ultimate metabolic conditioning workout that’ll take your technique AND explosiveness to a new level. Much like the pacing in a real boxing match, we’ll alternate between intervals of full-on “sprints” [think boxing, agility, and plyometrics] and active recovery, to help you hit your limits & then some. All levels welcome. 30-minute, one-on-one focus mitt sessions with your favorite PRVL coaches. In boxing, whether it's your very first time, or you're 10-0 in the ring, the learning never stops. Take advantage of a private boxing session to solidify your fundamentals or amplify your technique so you feel ready for your next SWEAT. You set your goals, and we'll help you crush 'em. Step into the [hypothetical] ring with us for a safe & supportive sparring experience. We’ll guide you through drills as you practice controlling your punches, reacting defensively, applying your footwork, and putting together combos. Prerequisite: 10 SUPER SWEAT classes, coach's approval, headgear, and mouth piece required. CHECK-IN: 30 minutes before class. PARK: KFC lot before 10AM, or street parking otherwise. 3rd St. & 2nd St. are typically the best places to check, but Martel, Fuller, & the surrounding residential streets usually have parking as long as you make sure to check the street signs! WEAR: Workout clothes & shoes. Boxer braids optional. BRING: Nothing! We’ll have complimentary glove & wrap rentals, along with a water here for you for your first time. You can leave valuables at home, or bring a lock for the lockers in our community space. RELAX: We’ll walk you through EVERYTHING. You’ll fill out a waiver, we’ll wrap your hands, and take you through a tutorial so you feel comfortable with our boxing technique and class format. By the time class starts you’ll feel like Tyson, minus the face tattoo. JUST IN CASE: If Beyoncé calls & you need to change or cancel your class, please make sure to do so with at least 8 hours’ notice to avoid a Late Cancel or No Show fee. You can [and should] read our cancellation policies here. For more juicy info you can check out our FAQ page, but we’re here to chat if you have any questions or concerns. Subscribe below to receive monthly email updates about the studio, special events, and class sales!